Let's call this stationery week at How About Orange. Friends inexplicably keep marrying and having babies, so here are some shower invitations I made with a pal last week. The mom-to-be registered for purple butterfly things, so I had to hold off on the orange cheetah-themed shower that could have been awesome. I think this one might be more tasteful. I made the design in Adobe Illustrator, then cut the cards out with the Silhouette machine. The party information is printed on an interior sheet. It's stapled inside the card along the spine to form a mini booklet. Chartreuse envelopes from Papersource plus these stamps finished it off. You can download the butterfly template as a PDF file, a zipped Studio file for Silhouette users, or a zipped SVG file for Cricut users. And folks without a digital cutter will have to make do with an X-acto knife. Eek, that's a little bit daunting. Wow, these are so cute, next time I order checks I'll make a order for these as well. Thank you for sharing this. Those are really cute. Luckily I have Illustrator! Wahoo! Oh, Cricut users take SVGs? That's cool. I'll add that as a file option for people. those are so cool. im loving all the stationary! these came out just so delicate and beautiful. what a lucky gal to have you for a friend. Nice how you color-coordinated the stamps, too. :) All in all sooo pretty! man that silhouette machine looks incredible..
Those turned out really lovely. I think the silhouette machine is proving to be quite handy. Beautiful and very appropriate for the occasion! Love the scalloped edges too. Gwenny Penny has just done Thanksgiving name cards with scalloped edges as well, they have both really caught my eye this morning. SO COOL! Those are amazing! What kind of stapler did you use to staple along the fold? Did you use a long reach stapler, or did you have another solution? Thanks for your help! I used a regular stapler, swung open. I put the two sheets of paper on top of a chunk of corrugated cardboard, stapled into the stack. I flipped the paper stack over and bent the staples closed with my thumbnail. A letter opener will bend them nicely, too. I love those! How delicate and beautiful! I noticed today that your ribbons were featured in dog collar form in another blog I read, Whatever. These are awesome! That cutter is darn versatile. Not a silly question. Right now you have to have a PC and some old Robomaster application. I didn't convert this; a lovely blog reader converted my PDF for me and sent it in, so I updated the post with it. I don't have a way to do it myself, being a Mac user. But: You can cut directly from Illustrator using a free plug-in from the Silhouette website. Or: The company says they will be updating the Silhouette Studio software this month to import .dxf files you make in Illustrator. Then maybe once you've got it open in Silhouette Studio, you can save as a .studio file. Thanks for all the info Jessica! These cutting machines are pretty awesome. Many ideas... little time. Seeing examples like this makes me very tempted to get a silhouette machine, but one concern is how quickly consumables (blades and cutting mats) wear out. How have you found them to hold up under heavy use on projects like this? So far, so good, but I do wonder about that blade. I cut 15 of these cards, plus some previous projects. I wonder how long the blade will stay sharp if it's used on paper. Vinyl and the heat transfer stuff seems easier on it. I'm less worried about the cutting mats. So I guess I can't answer that question quite yet; i haven't used it enough yet. It's holding up better than an X-acto blade, I can say that much. The blades for the Silhouette should typically last up to 6 months depending on usage and the type of material being cut. Please note that thicker materials will wear down the blade more quickly and the average life for heavy users will be closer to 2 - 4 months. The thickest material the Silhouette will cut well would be 80 - 90 lb weight cardstock, such as Bazzill cardstock. Attempts to cut thicker materials or certain materials the Silhouette is not designed to cut that are more dense (such as shrink plastic, foam, chipboard) or fibrous in nature (such as fabric) may ruin the blade or result in the blade dulling very quickly. Becsta, the download is a zipped folder that contains the Studio file. It won't display in your browser window, but it will download onto your computer. You can then launch Silhouette Studio, go to File > Open and choose the butterfly file. Thanks for sharing the lovely cut file. Thank you so much! These are really cute. Thank you so much for sharing!! 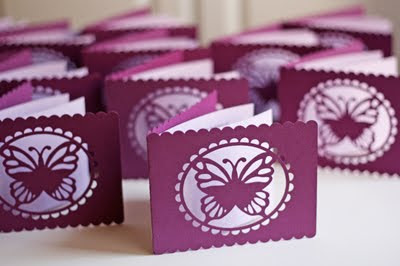 These are perfect for my daughter's butterfly birthday party. Such lovely cards! Thanks so much for the template; I used it for Mother's Day cards.